If you thought that the deepest and most irreconcilable divide among cooks around the world exists between those who use butter and those who use olive oil, or maybe those who bathe their barbecue in sauce and those who use a dry rub, or perhaps even those who eat salad before the main course and those who eat it after, you’re wrong. In fact, the biggest culinary divide is far more fundamental. In fact it’s so fundamental that many of you reading this may have never even noticed there is a divide. Basically, it all comes down to this: do you like salt in your desserts, or don’t you? Growing up in the US, which tends to be rather salt-heavy in its sweet things (just try to find recipes for brownies, chocolate chip cookies or pecan pie that don’t call for salt), I’ve always taken for granted that desserts of all kinds benefit from a pinch of salt. A pinch of salt in ice cream, a pinch of salt in custards, and a big pinch in cakes, cookies, and crusts; a small amount seems to deepen and round out flavors without making them actually taste of salt. Of course there are desserts that everyone agrees shouldn’t have salt, mostly fruit-based desserts that rely on the delicate interplay between sweet and sour for their appeal, but anytime things like cream, chocolate, nuts or caramel are concerned, I reach for the salt even without thinking. It was when I found myself altering nearly every non-American recipe I came across to include that crucial pinch of salt that I started realizing not everyone sees dessert through a curtain of savory undertones, and I began to think about where my persistent preference for slightly salty sweets comes from. What it really boils down to, I realized, is simple cultural conditioning. In many European countries, particularly France, Germany, Italy and the UK, people are accustomed to nothing interfering with the pure, sweet taste of sugar. Many cakes, custards, and pastries are made without any added salt at all, and can take some getting used to for us saltophiles. I’ve heard many Americans complain that they just don’t like European-style cakes and confections that much; to incite normally rational people to make such sweeping generalizations about the combined sugary output of an entire continent, I’m guessing it must be the influence of the insidious salt divide at work. Looking further afield, however, you realize it’s not just the Europeans who eschew salt in their sweets. Just about everybody from the shores of North Africa through the deserts of the Middle East and beyond would never dream of salting their sugary creations. And apparently, for people unaccustomed to salt in their sweets, the flavor can be just as jarring as a lack of salt is for me. I deeply offended a Middle Eastern friend of mine once by altering a semolina cake recipe he had given me to include my customary pinch of salt. He very nearly couldn’t eat the results, shaking his head and muttering that it tasted nothing like it should. Likewise, I’ll never forget the near-collapse my dessert ego suffered the day Manuel confessed to me that his mother, an accomplished cook herself, had complained about a sugary confection I had made for her in Germany. "Why does she make her desserts so salty?" she asked him. This was highly disconcerting indeed, that something I believed to be so delicious could be perceived so differently by other people. And naturally the fact that sweet things represent the category of food we hold most dear in terms of comfort and memory doesn’t help to bridge that gap – everybody thinks their way is the right way. To this day I still worry before serving a non-American something sweet I have made (unless of course they’re Norwegian, in which case I worry I haven’t made it salty enough!). But thankfully tastes are fluid, and the tides may be turning in my favor. Salt is actually appearing as a flavor in its own right on sophisticated European dessert menus, though naturally under more glamorous noms de plume than just ‘salt’, and there seems to be one guise it’s showing up in more than any other. My informants tell me that caramel au beurre salé (which for those of you who studied Spanish in high school, means caramel with salted butter) is one of the hottest phrases in Parisian dessert circles right now, and the mere mention of it in everything from macarons to glace guarantees a best-seller. Obviously to Europeans this salty-sweet sauce is quite a revelation, which does make me wonder what else they might like if only given the chance. Though it’s clearly still too early to say whether this love affair with salted caramel is indicative of a comprehensive change in dessert mentality, it is, from my perspective, a most welcome beginning. And what about you? If you’re unsure where you stand on the salt issue, just conduct a little experiment. Make this luscious salted caramel tart from the famed Parisian chocolate house La Maison du Chocolat, and see how many pieces you go back for. I’m not promising that I’ll win you over to my way of thinking (though I wouldn’t be surprised if I did), but at least you’ll know for yourself which side of the salted-dessert divide you fall on. In the meantime, you’ll find me here trying to retrain my tastebuds to appreciate all those desserts with less salt, you know, just to be fair. Which I’ll get back to after just one more slice of tart. Notes: I discovered that rock salts vary considerably in their ‘saltiness’, so to avoid over-salting the caramel mixture I recommend starting with the smaller amount and adding more only after tasting. Also, I tested the recipe with whipping cream (as opposed to double cream) since many people do not have access to the latter and discovered that it results in a slightly more liquid caramel (which you can see oozing out the sides of the tart in the above photo!). If you don’t have access to double cream (a very thick cream with 48% butterfat) and want your caramel more solid, I would recommend reducing the cream by maybe 3 tablespoons and substituting it with a couple tablespoons of additional butter. For the crust, sift together the flour, powdered sugar and salt and cut the butter into chunks. Place in a food processor and process, adding the eggs at the end, until a dough has formed. Roll out the dough into a circle and fit into an 11-inch (29cm) removable bottom tart pan. Chill for at least half an hour. Preheat the oven to 350F/180C. Blind-bake the crust by lining it with baking parchment, filling it with baking beans and baking for about 15-20 minutes. Remove the beans and paper and continue to cook the case for a further 10 minutes or until it is a light golden color. Remove from the oven and leave to cool. To make the caramel, pour the glucose syrup into a large saucepan and bring it to a boil. Gradually add the sugar, stir and continue to cook until the sugar has started to caramelize and turn golden brown. At the same time, in a separate saucepan, bring the cream and salt to a boil. Remove the caramel from the heat and very carefully add the cream – be careful as the mixture can rise rapidly in the pan. Stir carefully over a low heat with a wooden spoon until smooth. Remove from the heat, add the diced butter, and stir again until smooth. Pour into the cooled crust and refrigerate for 15 minutes. To make the ganache, bring the cream and honey just to a boil and pour over the chopped chocolate. Let it sit for a minute or two then stir until everything is smooth. Add more honey if it is too bitter. Once the mixture has cooled a little add the butter and stir gently until the mixture is smooth. Pour in an even layer on top of the cooled caramel, return to the refrigerator, and chill for 4-6 hours before eating. The use of salt is a topic I bring up almost weekly when teaching pastry classes. My take is this: you wouldn’t dream of not salting a soup, a sauce, a cut of meat – why shouldn’t dessert benefit from judicious seasoning? Melissa – that was a really interesting post, and I MUST have this dessert, it looks heavenly! What a beautiful tart! As for salt, I think it brings out the flavor of any dish, sweet or savory. Just a pinhc heightens any food. First of all, that’s just not fair. Putting up a photo like that and not making it possible for us to reach out and grab a slice? Just not fair. Secondly, I guess I’m more of an American than I thought. Of course I use salt in my desserts. It brings out the flavor of other foods, beautifully. Here in Seattle, Fran’s chocolates makes dark gray salt caramels that just make me swoon. hi melissa, what a sublimely savoury post 😉 that tart looks truly, mindblowingly good; i immediately rushed to my bookshelf to take a peek at the la maison du chocolat book, wondering how on earth i could have so carelessly missed something this incredible…as it turns out, it is not included in the book…thank you so much for the recipe! Hmm, I generally don’t like desserts to taste salty, but I believe a little salt is necessary to bring out the sweetness. My philosophy is…if you can taste the salt, you’ve added too much. I guess that as a European I am ‘culturally conditioned’ not to salt my desserts then:) I roasted some peaches in the oven with basil, butter, sugar and cinnamon during the weekend. When I checked out the original recipe in the NYTimes today, I was wondering why would they also ask to add some salt to the dish – it surely didn’t need any:) (and of course I used none:)I do use salt sparingly in cake recipes, as it improves the texture – and possibly also the taste – of the end result. But not in my desserts..I bookmarked this very recipe in Delicious when it appeared and have been thinking of making it since then – just out of curiousity how it’d taste with so much salt present. You’ve now convinced me that I should finally get my act together and give it a go. I doubt if I dare to post any pictures of my concoction though – you’ve raised the expectations too high again..Lovely post and mouthwatering picture! Melissa, I always love your beautifully written and thoughtful food essays. I’ve been thinking about the salt question myself, since I often have a tendency to add more than just a pinch…and I adore caramel au beurre sale in any form, but particularly with chocolate. Have you tried the salted chocolate tartine that’s been all the rage for the last year or so? A toasted slice of French bread, a piece of good dark chocolate on top, heated just until it melts, then drizzled with a tiny amount of good olive oil and a bare sprinkle of coarse natural salt? Sounds weird, I know — but people love it. There’s a sort of fragile, meltaway butter cookie that tastes good without salt, I’ve found. And fruit desserts don’t need much, although I’ve been known to put a tiny pinch. But everything else — mmmm, salt. And that tart? It’s going right on my must-make list. Cheers from New York. Very interesting article about to salt or not to salt desserts. I love Maison du Chocolat anything and am excited about this new recipe. Take care! Melissa,Excellent essay. It’s worth noting that salt is the only pure mineral we require in such quantities that we have a “taste” for it. In fact, our blood plasma is about 1% salt.Here in the Southern US many folks put salt on watermelon (I happen to like it that way myself). Melissa, I don’t think I can add anything that hasn’t already been said, so I’ll just say that that is an amazing photo of an amazing tart. Salt, caramel, chocolate and pastry. Perfection! In response to your earlier question re: salt, chili and mangoes, that is exactly how my southeast asian family eats green mangoes! But not ripe ones. Yum! And we put salt on pineapple too (but have never tried chilies). Dear MelissaI don’t mean to be finicky or anything, but I just happened to have a copy of the April 2004 issue of Delicious on my desk when I read your post. Naturally, after looking at your scrumptious picture and reading your delightful post, I eagerly flipped through the magazine looking for the recipe. Are you teasing me? Or am I just going batty and blind? I can’t find it. 😛 Of course, that’s not going to stop me from trying it out since you’ve thoughtfully posted the recipe too. Thank you! Hi Paz – I never thought about it either, until I moved around a bit and my tastebuds started rebelling at desserts that just didn’t taste right to me. And I’m sorry you haven’t managed to find squash blossoms yet – it may be too late in the year for them by now, so just mark your calendar for next summer to start the search early!Hi M – Okay, thanks for the tip! I don’t know if I’ve ever seen green mangoes for sale here, but I’ll do some asking at my local Indian and Pakistani markets.Hi S – No excuses needed, I would be just as finicky! I think the problem might be that you have the Australian version of Delicious magazine? I know that the UK version is an offshoot of the Australian one, but they do differ quite a bit (if not completely) in terms of content. The cover of the one I have is very pink with little rose-flavored meringues, and contains a large section inside on chocolate – in fact there is even a small picture of this tart on the bottom of the front cover, so if it’s not there, it’s definitely not the same magazine! Melissa – what a great discussion of salt and desserts. You are right – as Americans we do put salt in our desserts. However, I have a recipe at home for caramels in which the the caramels are elevated from ordinary to sublime with the use of a particular kind of salt – the French fleur de sel. After that discovery I bought all kinds of different salts that has made for great experimentation with desserts especially chocolate and caramels. I am dying to try this recipe. Hi Melissa,What a wonderfully written piece and what a beautifully photographed dessert. I’ve often wondered why many recipes call for salt. I’ve heard that it helps bring out the natural sweetness in some ingredients. Most often when I encounter salt in a recipe, I usually don’t add it in. I haven’t noticed a difference in the taste at all. Hi Maureen – Fleur de sel is definitely one of my favorites – I can almost eat it raw! I’m really happy that there’s a ‘gourmet salt’ movement developing with lots of different kinds being sold – it’s amazing to see how they can be so different from one another. And it’s hard to think of a better substance than caramel for showing off their finer qualities…Hi Reid – Thanks! I find it fascinating to learn what everyone else thinks of salt in their desserts and how they treat a recipe that doesn’t fit their tastes. Do you think it might be your Asian background that trained you to not put salt in desserts? Melissa – it’s like we shared a brain recently! I pondered the very same salty-sweet conundrum after baking a chocolate torte that benefitted by being served sprinkled with Maldon salt. It must be my upbringing – Canadian, Scottish and British…everything benefitted from salt in my house! Hi Jennifer – Yum, sounds good to me… I love Maldon Sea Salt too – much less expensive than Fleur du Sel (at least here in Britain) but with that same lovely briny complexity. I’ve never sprinkled salt on a cake after baking, however… now there’s a thought! Hi Melissa, I heard about the chocolate tartine (chocolate, olive oil, salt combo) through Amanda Hesser, a NY Times writer. I tried it and think the idea of it was better than the result. I’ll say that chocolate-covered olive oil potato chips are excellent though. There’s the crunch of the chip and smoothness of the chocolate. I think the olive oil’s richness pairs nicely with chocolate. I’m impressed that no one’s made an olive oil truffle yet! Making this tart was the sexiest thing I’ve ever done in my kitchen. It came out completely beautiful. The only bad thing was that I covered it and put it in the fridge when it was still too hot — condensation then formed on the plastic wrap and dripped back down onto the gananche, leaving a few splotches on the chocolate surface. Oh well, the yumm-yumm factor was much more important than appearance anyway. And this tart scored high for yumm-yumms. Salty and sweet is sultry. Interestingly enough, there is an almost identical recipe for this tart in Green $ Black’s cookbook "UNWRAPPED – GREEN & BLACK’S CHOCOLATE RECIPES". I ultimately used the particulars of this recipe though since I trust the French with my chocolate more than the English. I brought this tart to a dessert party and saved some for family and friends. I am now famous. Thanks, Melissa. Two people, however, did point out that it came out a bit sour. So I tasted it again. It was true! It was slightly sour. Why? I guess it has to do with the slightly sour-bitter nature of chocolate. All that Sharfen Berger dark chocolate assembled in such a high density I guess sours all the creme that’s in it. I too added extra honey to this recipe, and yet had this result. But, it wasn’t really a problem, just an observation. This tart is really, really, really good.Melissa, I didn’t add any less creme than called for and the caramel came out a nice balance between soft and stiff. Do you think it’s not just about how much creme is in it, but also about how long you cook the caramel/how hot it gets? I waited until all my sugar had melted into the caramely mass and stirred it up in a liquid state before I added the creme and salt, so the temperature of my sugar must have been pretty high (careful not to get too high, else you might end up with a toffee layer at the bottom of your tart!). Having recently made some Bobby Flay desserts, I was used to souffles coming out as dry cakes, chocolate ganache coming out as soup that won’t even harden in the freezer, etc., etc. It was refreshing to work on a recipe that really works. Not only that, but the recipe for the ganache works better than any I have ever made. This gananche pours in smooth, and cools into a perfectly voluptuous and silky creation.Weeeeeeeeeeeeeeeeeee!Twas fun. You should try it too! What a gorgeous looking tart. Being from the US, I was surprised to read your post about Europeans not liking salt in their desserts. I guess my take on it is that salt in desserts is not supposed to add a salty flavor, but that its presence is important as a flavor enhancer. Much like acid in the form of citrus juices or vinegar, salt enhances the flavor of what it is added to. Salt makes beef taste beefier, chocolate taste chocolatier, squash taste squashier. One would never dream of making bread without salt, though of course it is done in some areas of Italy. And I don’t mean to cast aspersions, but I find bread made without salt to taste of nothing. Of course too much salt in anything just tastes salty. I am surprised that anyone would be able to taste the presence of the small amount of salt in most desserts, though again, I am American and my palate may just be used to it.As well, my experience in France, especially in the north is that cooks and bakers use salted butter in almost everything. It produces the most wonderful butter cookies and caramel, the caramel you so beautifully made in your tart. I have actually heard from French cooks that the popular use of unsalted butter by Americans is strange. Of course, if we had access to the wonderful high fat beurre sale that the French had, maybe we’d use it more!The recent salt trend in desserts I have found to be most interesting is sprinkling a few grains of fleur de sel, or any other large grained salt, on top of chocolate desserts. I think it would be phenomenal on top of your salted caramel tart. I find that chocolate in particular truly responds to salt’s flavor enhancing qualities.Thank you for sparking such great discussion on a truly interesting topic. And as for the tart, bravo! I am new to your blog, Melissa, and have spent the entire morning, now afternoon, reading and salivating. Regarding the salt issue. I have always used salted butter. I laugh and laugh at recipes that call for unsalted butter and then ask for 1/4 teas. of salt as the next ingredient. Makes no sense. In my travels, I found the most wonderful salt from Salt Island in the BVI’s. The island is mostly overlooked by visiting sailors but, being a foodie, the name alone called for a visit. The island is deserted except for a rickety shack and an almost toothless man who is the official "salter." There is a large, large swampy area where the salt is collected and once a year, a pound of salt is sent to the Queen. The salt is wonderful and for $3.00 US I sailed away with a five pound bag! The various salts of the world are wonderful, each with a distinctive flavor but for my money, nothing beats Salt Island salt! I will definitely use it will trying your gorgeous tart. Good work, Melissa and congrats on your PHD. this tart is perfection on a plate, I served it up at a dinner party and I had everyone coming back for seconds. I also did my own twist on this by omitting the last 1/4 cup of flour and added cocoa instead for a truely deccadant chocolate desert!!!! This is absolutely amazing and delicious. Quite the process, but more than worth the effort. A small piece of this tart hits every one of my dessert craving spots, and I know full well not to overindulge. So decadent. As my name suggests, I believe everything benefits from athe addition of salt. Life without salt is just bland. For the reader who would prefer not to use corn syrup, what do you think about substituting agave nectar? Very interesting (not to mention the scrumptiously lush looking dessert, which I'm gonna try very soon). I'm from Hungary and I don't like it when desserts (especially the pastry part) does not contain any salt. I might be alone with that though. My mom taught me to always add a bit of salt to everything, exactly to lend it flavor (think about pastry, which would be pretty bland otherwise, unless it is flavored with an additional something).On the other hand I could never imagine desserts which are sweet AND salty, such as peanut butter-based desserts or anything that has more than just a small pinch in it where you can actually taste the salty flavor. But when I tried some American recipes which called for extra added salt for a salty-sweet flavor, I was very pleasantly surprised. So I guess it just depends on whether you like your sweets one particular way or are open to new tastes. OH! Looks so delish! My mom used to make a "Caramel Hazelnut Torte" that looked a lot like this. Definitely had salt in it. Definitely yummy…I suspect this recipe could be used to try to duplicate this fond childhood dessert memory of mine (I can make a crust with some ground hazelnuts in it, right? And decorate the outer edge of the torte with whole, skinned, toasted hazelnuts? )Thanks for posting! I've been arguing with my mother over this issue for 10 years! I have never used salt for baking, ever – yet she insists there is a "chemical reaction" between the sodium and baking soda/powder that I am lacking. I keep a container of salt on hand for cleaning purposes, and although we have salt shakers filled with salt, I have taped over all but one hole for those who insist on salting (usually as soon as they sit down). They shake away and never comment. Anyway – I was surprised to discover that I actually like the taste that this "new" salted caramel, and your recipe looks delicious! (I also happen to like salt on popcorn and potato chips – but thats all!). No salty like the ocean pasta water for me. Makes me want to gag!! This tarte looks amazing, I need to do one this weekend! Thanks for sharing and thanks so much for these gorgeous pictures which made me hungry and starving for one piece! As soon as I saw the photo of this tart I knew I HAD to make it. So I did. But unfortunately, since I'm new to making caramel, I messed it up. The recipe said to boil the syrup, but then I was at a loss as to whether I needed to keep the heat up high or turn it down. My first tart I turned it down too low and I ended up with sugary lumps in it, and not a rich caramel flavour. My second tart I turned it up too high, and ended up with a toffee layer. I'm assuming I need a combination between the two heat settings. Any advice or suggestions would be greatly appreciated. I plan to master this dessert! The difference (Europe vs. U.S.) certainly IS marked. When I first moved to Germany years ago, I admired the sumptuous tortes but found the taste curiously flat. No salt. After a dozen years there, I returned to the U.S., only to find everything unbearably salty. I stand now at a midpoint, using considerably less salt than most Americans. I'm not certain our taste for salt is good for us — high blood pressure and all that. I found you on Pinterest and I'm so glad. This looks wonderful!!! This looked amazing and I made it for my wine club! However, I wasn't totally impressed. The crust is a little off, and it's impossible to get out of the tart pan (not sure why a regular pie pan wasn't recommended). Also, to get a clean cut you have to have it really cold which made the crust literally impossible to cut through. I enjoyed it, but not sure I will be making it again. Caramel and Chococlate. 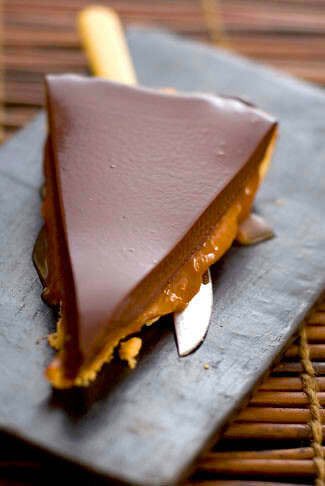 Caramel and Chocolate on a tart… This. must. be. heaven?! I must have cooked mine too long, it cooled to toffee, how long did u cook ur sugar? NOTE: A U.S. stick of butter is not the same as the stick of butter in the recipe! I just made this and i'm crossing my fingers it turns out. If not…try-try again! Thank you! My mouth is watering!! The photography is beautiful and the tart looks sensational.